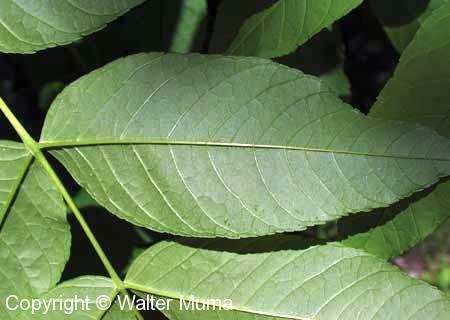 Distinctive features: Tree; Opposite bracnhes, compund leaves, grows in wetter areas. 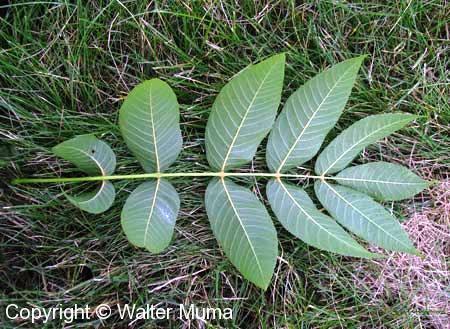  Red Ash (Fraxinus pennsylvanica) - does not grow in wet areas. 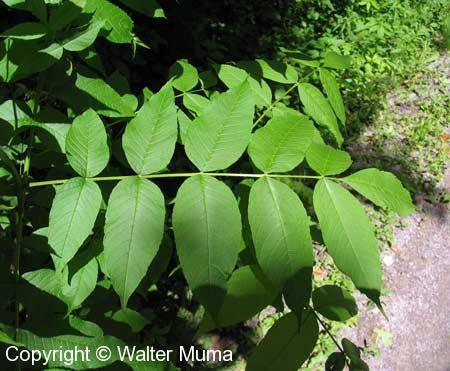  White Ash (Fraxinus americana) - does not grow in wet areas. 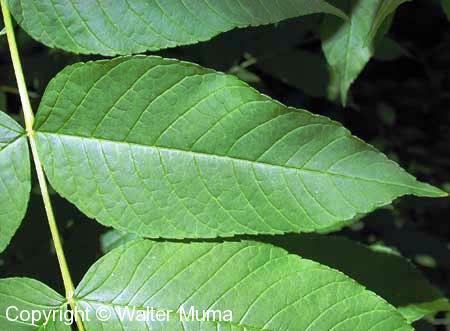 Leaves: Opposite/Whorled, Compound, Entire; Opposite, compound. 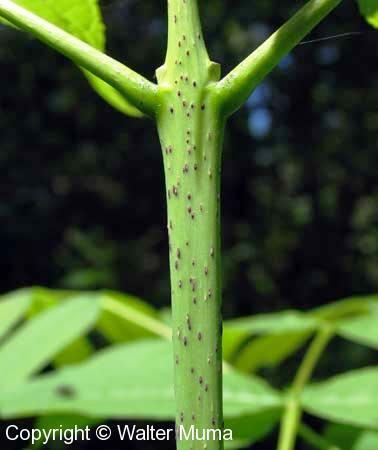 Leaflets have no stalks whatsoever. Smooth on top. 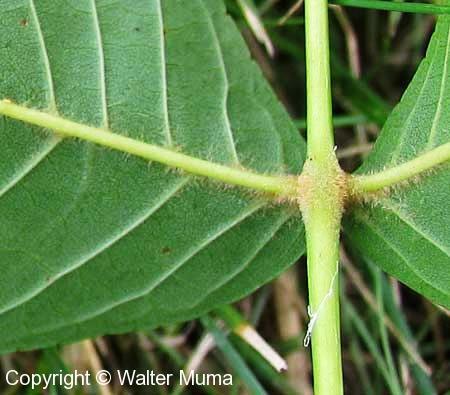 Hairy on undersides only where leaflet joins leaf stalk. Trunk: Corky when young. Scaly when old. Habitat: Wet Areas; Wet areas. Photographs: 122 photographs available, of which 21 are featured on this page. SCROLL DOWN FOR PHOTOGRAPHS. Underside of another whole leaf. Upper side of a leaflet. Note that there is no stalk on the leaflet. This is a distinctive feature of Black Ash. Underside of the same leaflet. This photo highlights the lack of leaflet stalk. Except for these tufts of hair where the leaflet joins the stem, readily visible in this closeup photo. Growth form of the leaves. Leaves opening in the spring. 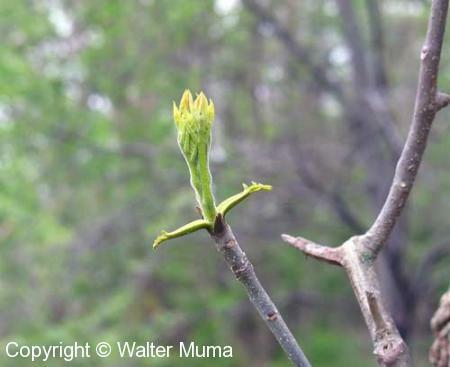 I don't like to anthropomorphise (attribute human ways to plants and animals), but this really looks like it's saying, after the long winter, "Ahhhhh!". 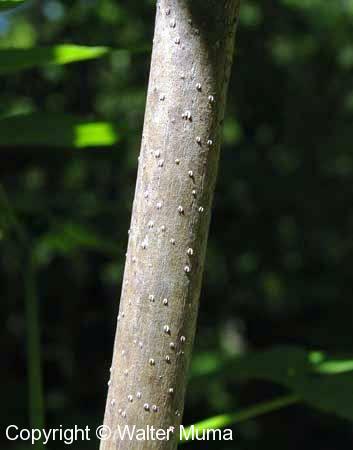 Detail of a twig. Note the black dots scattered along its length. And also the sometimes flattened appearance. How we come to the next distinctive feature of Black Ash: "Black is back". 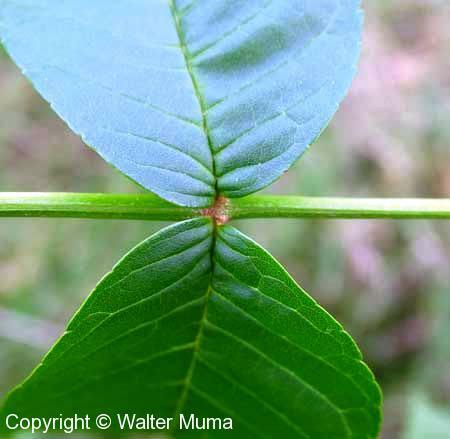 This refers to the two end side buds being located somewhat back from the end terminal bud, as shown in this photo. 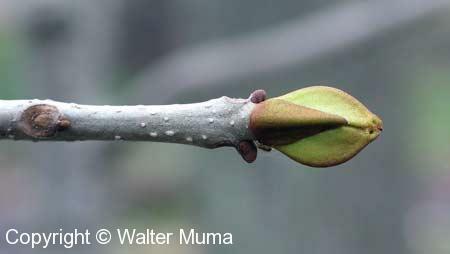 Note also the ridged shaped of the terminal bud. Typical corky ridged bark on young-to-medium aged trees. A very young tree. 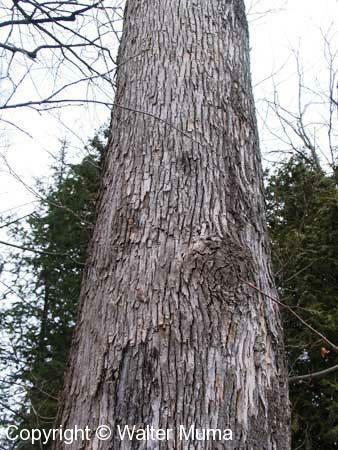 It goes from this smooth bark, to the corky ridged bark, to the scaly bark of older trees (below). This tree had me fooled for about 15 minutes, along with my friend who was a native plant specialist, until we finally figured it out! Problem was, we were going by what the books say, that the bark is corky and ridged. We hadn't read in the few books where bark was described as being scaly. An older tree, but still very young. 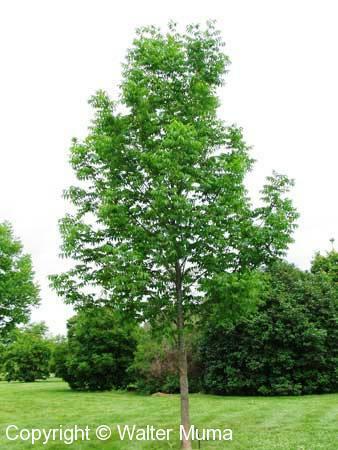 Black Ash trees like to grow in wet areas such as swamps and marshes. But if planted, they will grow elsewhere. Black Ash seeds in the winter.